Bathroom Vanities and Accessories Design and Tips | DecorPlanet.com Blog: Adding a second bathroom sink - a good idea? 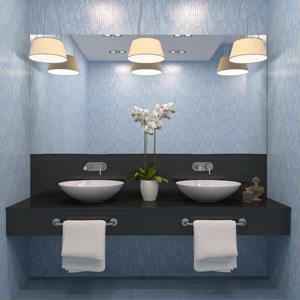 In the process of remodeling her bathroom vanity, a woman identified as "Laura" asked plumbing advice columnist Ed Del Grande of the Seattle Times whether a second sink and medicine cabinet would make a good addition to her restroom's decor. "If your existing plumbing is in good shape, a licensed plumber should be able to 'twin' in a second lav sink. I’ve done jobs like this," wrote Del Grande in response. "As long as the second sink can be installed according to local codes, it can be a very nice addition to any bathroom." Noting that Laura wrote that the bathroom she's remodeling also happen to be the only one in her house, the expert emphasized the practicality of having two sinks available. He wrote that he's frequently gone to use the sink in his bathroom, only to find it occupied with someone's soaking laundry. After soaking dirty cloth items in a sink, it might be advisable to give it a thorough cleaning afterwards. Readers Digest has provided a set of instructions to make sinks as clean as they can get. Scrubbing, as opposed to a simple wiping with soap and water, is recommended for sinks after they've been used more than 30 times - which likely means once or twice a week for most households. Placing paper towels soaked with bleach along the surface of the white porcelain counter could add to its sparkle, however this process will fade colored surfaces. In addition, using vinegar is noted as an effective method for removing lime deposits. To get clogging substances out of sinks, Readers Digest recommends mixing one cup of baking soda, one cup of salt and a quarter cup of tartar cream. Pouring a half a cup of this mixture into the sink and then a quart of boiling water should help keep substances flowing smoothly through pipes.